Cake Pops | Halloween Cake Pops & Happy Halloween !!! with their costumes at school tomorrow.I was not planning to make these until my li'l one dropped the cutting board on the warm tutty fruity cake before it could be cooled,sliced in pieces.Shoo..all was crumbled up,though we tasted the cake but none had much.That's how I pondered for ideas and cake pops was the best way to use them up.Am happy that I ended making this up,kids truly enjoyed the pops.Although the bats don't look much as bats,isn't it?? I couldn't spend much time decorating these and so ended up making a messy bat,must say.Wishing all a happy Halloween,enjoy !!! FOR CAKE-Prepare the cake as per the recipe.Make coarse crumbs of the cake. FOR VANILLA FROSTING-Using a electric whisker,cream the butter in a bowl.Add the vanilla extract and icing sugar little by little by mixing each time.Beat until you get light & fluffy frosting.Divide in half and place in large bowls. 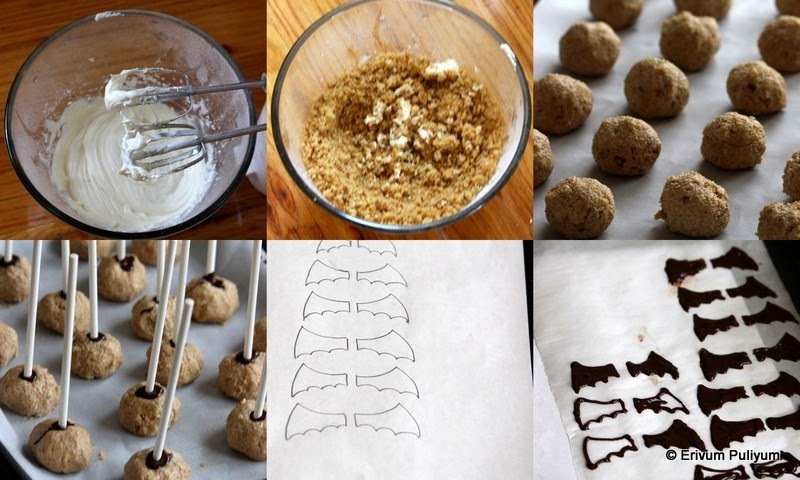 FOR MAKING BAT WINGS- Melt some dark chocolate using double boiler.Make a stencil of the wings like in pic.Place this under a butter paper or parchment paper.In a piping bag,pour the melted chocolate and use small round tip to line the border and fill in. (I wasn't very good in piping and so took quite sometime)Place this in the freezer for 4-5 hours to set. FOR CAKE POPS-Make small lemon size balls and place them on a parchment lined paper.Place these in refrigerator for about 30 minutes.Now,melt the chocolate in a heat resistant bowl by double boiling.Dip each cake pop stick in the melted chocolate and then pierce it through the ball halfway.Now dip in melted chocolate and rotate to cover the whole ball.Keep rotating gently or shake excess before you place on the styrofoam.If making bats,then place edible eyes in front,two chocolate chips on head and attach each freezed wings.Refreeze again to set. If using, CANDY MELTS-Place it in a heat resistant bowl and melt the candy over double boiling method.If the melt becomes too thick then add the vegetable shortening or any flavorless oil.Mix it well until it turns flowing consistency.Dip each lollipop stick in the candy melts,and then pierce through each ball halfway through.Now,shake off the excess and place on the styrofoam.Let it dry for 3-4 minutes.Add sprinkles on top and enjoy!! * For quick and simple version,use box cake recipes and store brought frosting. * You can use any other basic vanilla cake or chocolate cake recipe to make the cake.OR any left over cakes would work best.Also can use chocolate frosting or vanilla frosting. * Shake off all excess melted chocolate or candies to avoid messing the sticks like mine. * I had some small white candy which I used for eyes by adding a little chocolate in the center for eyes.You can use edible eyes. Pacha Manga(raw mango) curry is a very simple yet delicious curry to serve with steamed rice.This curry has the perfect blend of spice & sour flavors that makes it lip smacking one.I love anything with raw mangoes.This is a very simple recipe to prepare hardly takes time to cook.This recipe is adapted from a cookery show.I am sure your kids will devour an extra scoop of rice when you prepare this curry.Read it along & don't forget to give it a try,enjoy !!! Wash,peel and slice the raw mango in long thick slices.Keep aside. In a bowl,add onion,green chillies,crushed ginger,coconut oil(1 tsp) and little salt.Mix it well with your hands and keep aside for 10 mins. 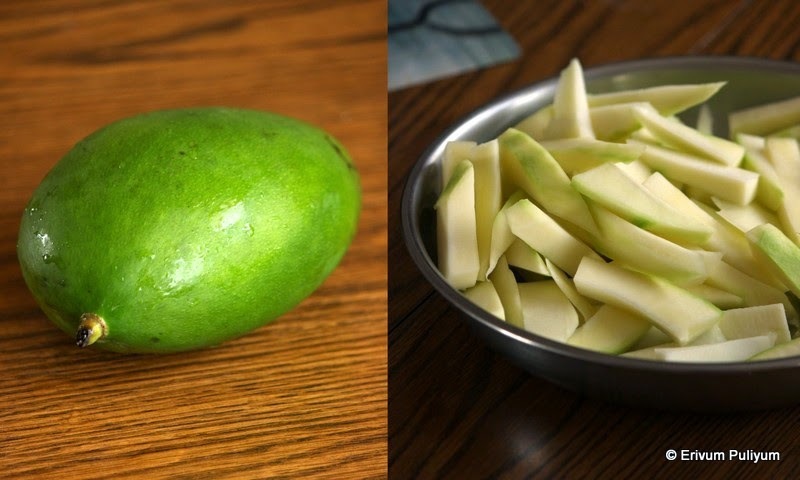 Mix the raw mango slices to the same bowl,add the spice powders,salt.Keep aside for 15 mins. Heat a pan and add this mix to the pan.Add in the thin coconut milk in the mix and cook till mangoes become tender and the gravy becomes thick. Add the thick coconut milk to the curry on low flame.Mix well,switch off flame. Heat a pan and add mustard seeds,let it splutter.Add the fenugreek seeds,curry leaves and sliced shallots.Fry till the shallots turn golden brown.Switch off flame and pour this over the curry. Delicious pacha manga curry is ready to serve with rice . * I have used canned coconut milk.But you can use fresh coconut milk too. * Try to cut the onion very thinly sliced as there is no sauteing of onions involved. Though snacks are always inviting at my home,but they are enjoyed best on a rainy day or in the months to come(winters).Do you feel the same esp these baked snacks?? Initially when I landed in US,I hardly new about zucchinis & never added them in my veggie list.But gradually thought about trying these green and yellow ones,now have regularly stacked up in our refrigerator.They are also known as courgette and relatively are a low calorie vegetable.They have moderate sources of folate & potassium.I sometimes prepare potato-squash curry,other times in bread or salads.But this is the first time I tried these baked fries.Everyone liked it at home,what more do you want.These were similar to the baked avocado fritters and loved it !! Wash,peel the skin of zucchini and cut in thick slices of 2.5- 3" long. In a bowl,add the parmesan cheese ,bread crumbs,pepper powder,italian seasoning and salt.Mix well. Place all three- beaten egg in a bowl,all purpose flour in another bowl and bread crumbs mixture in separate shallow bowls. Drop each slices in the flour then dip in egg.Then finally roll in bread crumbs mixture and coat well to cover fully. Pre heat oven to 400 degrees F and keep a tray coated with cooking spray. Place all sliced rolled zucchinis in the tray and and drizzle about 2tbsp of oil. Bake in oven for 15-20 minutes until golden brown and crispy.You can turn the tray half way for even browning. Serve warm with marinara sauce or tomato ketchup !! Achari Chana Pulao,the name itself creates mouthwatering flavors.This is one of the quick fix lunch box meal,highly protein rich one.Though I have tried making achari chana(chole) sometime back but this one is slightly different and makes one pot meal.I usually don't soak chana for this particular recipe as I always soak a cup extra for cooking chana masala and reserve the one cup of cooked chana in refrigerator.That way things become much easier for me.This pulao has the tanginess of mango pickle and infused with tid bits of cooked chana.We liked it with cucumber raitha and mint chuntey.You can use any desired raitha and devour happily !! Wash and soak the basmati rice for 20 minutes- an hour. If you have cooked chana or store brought,can skip this step.Else,soak the chana in water for 6 hours or overnight and cook with enough water and salt for 3 whistles or till done in a pressure cooker. Heat a cooker and when its hot,add ghee to it.Add bay leaves,splutter mustard seeds,add in fennel seeds,kalonji seeds,fenugreek seeds. Add the sliced onion and saute till translucent.Add the green chillies,ginger garlic paste and saute till raw smell disappears. Blend the pickle in a blender coarsely so that the mango pieces are mashed well.Mix the pickle and yogurt together,with chilly powder. Add the hing and cooked chana,saute well.Add the mixed paste,turmeric powder and saute well for a minute. Add the soaked rice after draining water.Add water,salt and bring to a boil.Cover with a lid and let the rice cook on low medium flame. Fluff with a fork when its 3/4 th done.Add the chopped mint leaves and cilantro. Serve hot with a simple raitha !! * You can use any other achar /pickle to prepare this but mango tastes the best because of the tangy flavors infused. * You can use oil for a less caloric version. * I have not used kalonji seeds in the recipe.If you use the onion seeds,then feel free to add. * You can even add fried raisins. * You can add boiled cubed potatoes too to make it even tastier. Hope everyone had a great Diwali.Today's post is Beetroot kichadi(pachadi). Beetroot khichadi is one of the colorful kichadi(pachadi) served in sadyas.And my kids like this pachadi because of the color,I feel.This is one of the simplest dishes that can be prepared in advance in sadyas.This is a very old draft from our Onam sadya this year,now finally out before the next Onam arrives,lol.This is a perfect side dish with the spice,sweet and tangy flavors.Do add this to your sadya list if you haven't tried this yet or serve with steamed rice sometimes.Enjoy !! Grind the coconut,cumin seeds,mustard seeds and green chillies to a smooth paste using water. Heat a pan and add the grated beetroot,cook till done.Add in this coconut paste and bring to a slow boil on low flame.Add salt. Whisk the yogurt with a spoon and then add to this cooked beets on low flame. Switch off flame when a boil or two appears at the sides.Adjust salt if required. Heat oil in another pan to temper the khichadi.Splutter mustard seeds,add broken dry red chillies and curry leaves.Switch off flame,pour over khichadi. *A tangy yogurt makes the best to this curry. *Add green chilies as per tolerance. *Use the small grater holes to grate the beetroot,cooks faster and tastes good. For more sadya recipes,click here. Everyone loves easy quick fix breakfasts,Isn't it? And here at my home,they need a varied breakfast each day whether its dosa ,idli or uthappam of the same batter atleast the looks must be different.But sometimes quick healthy pancakes does its best.Pancakes are quick fix ones and are easy to whip up in very less time with any desired fruits.This pancake is my kids favorite with their favorite blueberries in it.I use wheat flour to make pancakes but you can always use all purpose flour(maida) for a more lighter texture if you wish.These pancakes have the perfect citrus flavors with cooked blueberries. Sift the flour twice with baking powder and salt in a wide bowl. In another bowl,mix the milk/water,butter/oil,vanilla ,lemon juice & lemon zest. Add the flour in it and whisk well without lumps preferably but if you have few just leave it like that. Wash the blueberries,drain water and fold in the batter. Keep the batter covered to rest for 10 minutes. Heat a pan or griddle.When its hot,pour a ladle of batter and don't spread much. Cover with a lid and let it cook,you may find bubbles that appear at the surface and break. Once the sides look browned too,flip and turn the other side.Let it cook for a minute. Serve warm with maple syrup or butter. * If you are adding milk,then bring to room temperature before adding to the flour. * You can use all purpose flour/maida for a lighter fluffier pancakes. * You can always change the blueberries and add any other fruits of your choice.If you are using other fruits,try to chop them very small like these cutees. For more breakfast recipes,click here. Cherupayar(green gram) curry is an age old traditional curry that pairs perfectly with puttu just like kerala style kadala curry.This really makes a very lip smacking combo with puttu and pappadam.We add a tsp of hot ghee too to get the actual flavors.This curry can even be served with rice or even chapathis.Hope you guys like it and enjoy making this at home !! Wash and cook the cherupayar(green gram) in a pressure cooker with turmeric powder,chilli powder and salt to taste for one or two whistles.Switch off flame. In a blender,grind the grated coconut,cumin seeds, and green chilli to a smooth paste. Heat another pan and add oil.Splutter mustard seeds,followed by red dry chillies and shallots,crushed garlic.Saute about a minute and now add the cooked green gram. Add the ground paste to the cooked moong dal.Add a cup of water or more and then bring to a boil.Add salt or chilli powder if required.Switch off flame once it reaches the desired consistency. Serve warm with puttu /steamed rice flour and pappadam. * You can add or reduce spices as per tolerance. * The green gram that I sued to buy in India used to take longer to cook but the packets I get here cooks faster.So,cooking time may differ from each packet and brand. Diwali aka Deepawali is around the corner and blogosphere is already loaded with sweets & savories.Not only blogosphere,everywhere its celebration time.Hope you all have started buying crackers,sweets & new dresses.Festivities are all a perfect time for get togethers with family.Though we don't celebrate Diwali as such but sweets are welcome to all at home.Rava laddu is a simple sweet that can be made in a jiffy without much efforts.These cute off white balls are very tempting and can be stored over a month if you make it in ghee.These laddus are best made with fine sooji/semolina but if you have coarse one used for upma then grind to fine before proceeding with the recipe.My kids loved these a lot and in fact they have already added this to their repeat list of snacks.So,if you haven't started off making sweets for Diwali or if you are a beginner to making sweets then this can be a good start.Do try and enjoy !!! Dry roast the semolina in a pan for 3-4 mins on low medium heat or until a nice aroma comes.make sure the rava is not burnt or turns brown.Keep aside. In a blender,powder the sugar and keep aside.I used the coarse semolina so,added to the blender and powder it.Add the dry dessicated coconut and grind again. In the mean time,heat a pan with 1tbsp ghee in it.Fry the raisins and broken cashews.Remove on a plate. In the same pan add the remaining ghee and let it become hot.Add the blended rava,coconut. Add the powdered sugar and cardamom powder,mix well. When warm,make lemon sized balls in your palms and then place in a plate.If you are not able to hold them together or if you wish to use lesser ghee then add about 1-2tbsp of milk and then shape them.Its better to avoid milk and make it in ghee to increase the shelf life of laddus but if you are making a smaller batch and you are pretty sure to finish it off in a day or two,then go ahead and add milk. Serve or store in ziploc bags or air tight containers. * You can use fresh grated coconut too but fresh grated coconut reduces the shelf life of laddus.Also,the off white color of laddus becomes dull.If you are using grated coconut,then dry roast it in a pan till all moisture is dried up and then grind it with rava. * If using fine semolina then skip the grinding part. * You can even add the cardamom pods along with sugar to powder it fine.I had powdered cardamom so just avoided that. 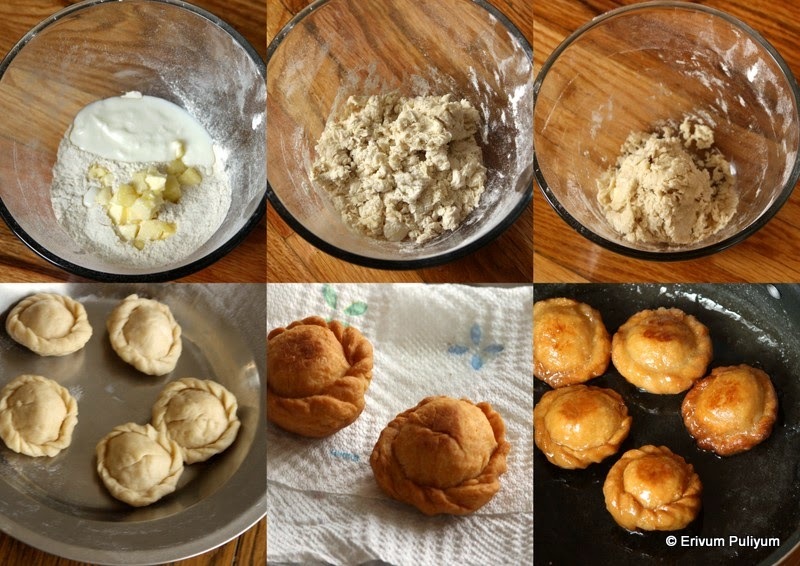 * You can keep these laddus at room temperature for weeks if making ghee alone and not adding milk.If you are adding milk,refrigerate and then serve at room temperature whenever needed. * Use the darker shade raisins to give a contrasting look in laddus. Pacha moru /Sambharam is a perfect thirst quencher on a hot sunny day after a tiring day.This doesn't need a blog post as such because there is no elaborate recipe attached to this.Its very famous in Kerala and I remember my grand father used to love this a lot.Last time,when I went to Kerala,I saw people selling buttermilk packets in train too,a hot seller in train journeys in the hot weather.In sadyas,this is one of the dishes and its really helpful for people who wish to try making this at home in a jiffy.Sambharam is spiced buttermilk with the addition of ginger,green chillies and flavored with shallots and curry leaves.If you haven't tasted this yet,do give this a try soon to feel energetic !! Using a mortar & pestle,crush the peeled shallots,ginger,green chillies.Keep aside. Add the yogurt to the blender jar,add water and pulse it 2-3 times to mix well. Transfer this in a bowl,add the crushed shallots,ginger,green chillies.Add in curry leaves and salt.Mix well. Leave for 10-15 minutes for the flavors to seep in. Pour in glasses and enjoy !! *The yogurt should be slightly sour to get the actual flavors. Chicken Sukka is a dry version of chicken made with a blend of spices and coconut.This is one of the popular Mangalorean dish.The authentic way demands dry roasting all spices and then grinding them.Also dry roasting the coconut and grinding coarsely.The best thing I noted in this recipe is that there is no use of oil in the curry and only ghee is used towards the end to temper the onions.If you can't take ghee then fry in oil,but ghee really enhances flavor and the amount is very less.Everyone liked it at home,am happy it turned out fragrant and delicious.Do give this a try and enjoy !!! Chop and wash the chicken under running water 5-6 times or until water runs clear.Drain water and place in colander. In the same pan,add the chicken pieces,chopped onion,ground paste(3/4) and salt.Cover and cook on low flame.Don't add any water as chicken leaves out water. In the mean time,heat another pan.Add the grated coconut,crushed garlic,cumin seeds.Dry roast this for 2-3 minutes until the coconut is fragrant and don't let the coconut to get browned.Switch off flame and grind to a coarse consistency along with reserved ground paste. Wait till the chicken is almost cooked,add the coarsely ground coconut paste and cook till the gravy is thickened and paste is well coated. Heat another pan and add ghee.When hot,add the sliced onions,cinnamon.Saute until it turns golden brown,add in the curry leaves. Add the tempering to the curry.Serve hot with rice,chapathi,rotis or neer dosa. 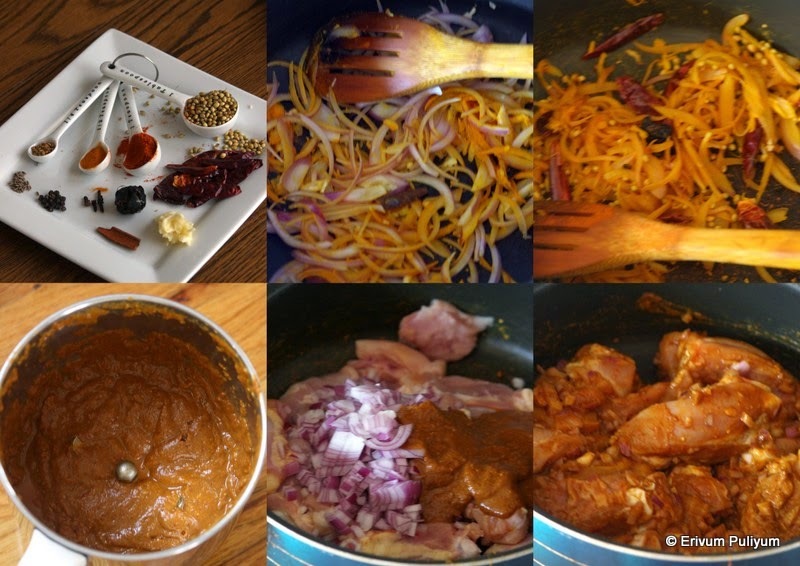 * You can use chicken with bones or boneless for this curry.I used chicken thighs with bones. 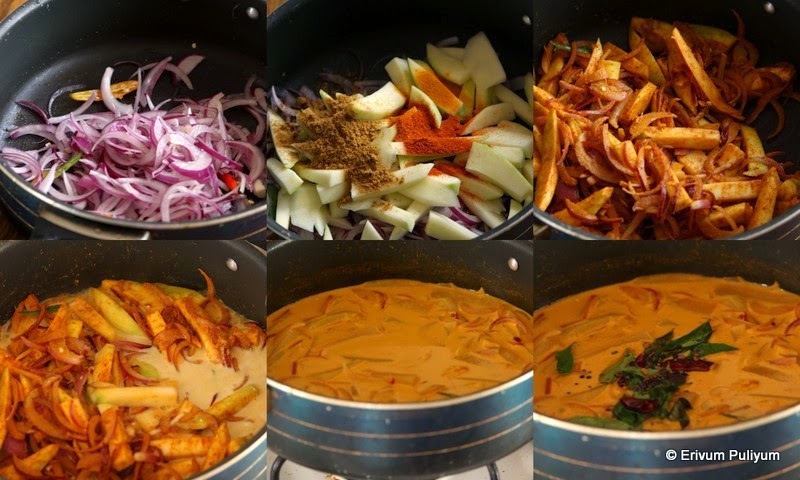 * The color of the curry fairly depends on the variety of chillies you use for the curry. * I didn't have kashmiri dry red chillies so used 2 tsp of kashmiri chilly powder.You can use different varieties of chillies as per your likes and increase spice as per tolerance.This yields a moderately spicy chicken. 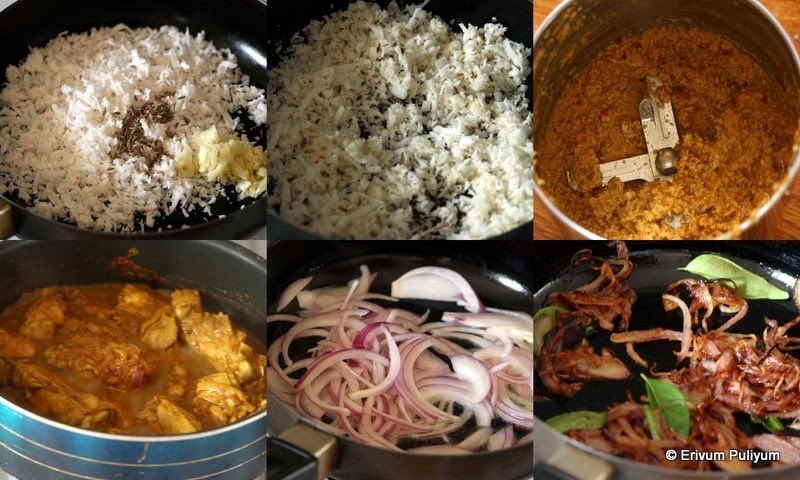 * Adding curry leaves is not in the original recipe but I have added as I like the flavors. If you're interested to check out more chicken recipes,click here.